We are certain that a visit to Gray & Bull will not dissapoint. We have put together our "Top Ten Reasons to Choose Gray & Bull". There are more reasons, but we thought that 10 was a nice round number. To request a FREE link to the "Top 10 Reasons...", please complete your details below. Or you can call us on 0115 9418121 to request a FREE copy to be sent to you in the post. You are under no obligation to buy from us, but when you see our fantastic frame and ophthalmic lens choices, you will not want to look elsewhere. So what are you waiting for? Start your journey with Gray & Bull today by completing your details below. I have often passed the store but not been in before. My new lenses are the best lenses I have ever had (I'm a glasses wearer of over 20 years). The team are extremely friendly and helpful. I was not rushed in any way - excellent service and excellent experience unlike some other opticians. I have had very positive feedback on my new glasses. I have passed the shop front on many occasions and liked the presentation of the different from usual glasses. Gray & Bull have "above and beyond service" in getting the right choice of frames and matching lens shape. My experience was fantastic. All staff have been great and made me feel welcome and have also been very patient in allowing me to take time choosing a frame. The experience is not the run of the mill hurry up and go - it has been a personal service. Thanks. I'm a sucker for a 1930's shopfront and the business looked quirky and interesting. I found Gray & Bull scientifically informative and the staff were very attentive. I am very pleased with my new glasses. I have been a customer of Gray & Bull since the 1970's and have never used any other opticians. The staff are pleasant and always friendly. I chose Gray & Bull because of the range of frames as well as the quality of lenses and the service from the staff. My experience was excellent compared to other opticians I have used in the past. I came to Gray & Bull after leaving my previous optician because of various focal problems that they could not resolve. Gray & Bull were able to sort me out perfectly and also find me a new frame. I will definately be coming back and would strongly recommend them. Superb choices of high quality luxury frames. Very friendly, professional and knowledgeable staff and great custoer service. Thank you for a great experience. Lovely staff! Great service! Yor certainly get what you pay for. If you value your eyes, go visit the staff at Gray & Bull! I chose Gray & Bull because of the traditional shop front and the interesting display in the window. My son plays ice hockey and needed a pair of glasses that would fit under his helmet. The staff are very professional and informed. Well done. Gray & Bull offer the best choice of hard to find frames and also offer the widest choice of lens options that I have ever seen. Their customer service and personal approach are second to none, and they really take the time to get to know you and your needs so that they can recommend the best products. I will never go anywhere else. I wanted to try an independent optician rather than usual high street operators. On receiving my new glasses I could not read at all. Gray & Bull immediately fixed the problem which turned out to be the prescription that I was originally given by one of the large multiples. Brilliant service - first class. I will return - thank you. I had known then name of the practice for many years - when I needed to find an opticians - where else would I have gone? My new trendy Maui Jim sunglasses had their first outing to India, and were superb. I can't compare Gray & Bull with any other opticians as I haven't felt the need to try anywhere else. 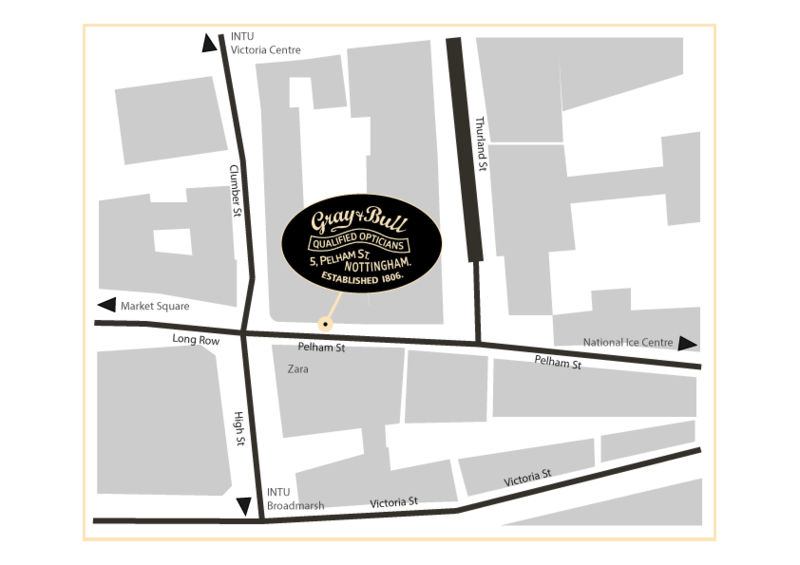 The service that I get at Gray & Bull is simply wonderful and the atmosphere is great. I came to Gray and Bull as they have a better choice of shades. 10/10. Very good service and great range of frames with helpful advice over choice. Having had problems with my varifocals elsewhere it was a refreshing change to be cared for and sorted at Gray and Bull. I wanted an independent optician that provided a personal service. My parents used Gray & Bull in the past. There is no rush and time is taken with each individual to ensure they have the correct eye needs. I have tried large companies before but they are unable to get the varifocal lenses correct. The other opticians cannot provide the service that Gray & Bull can. Eyes are important - you only get one pair. Because Gray & Bull are independent, they get to know their customers. Both myself and my husband are clients, and if one of us visits, the staff always ask after the other. Brilliant service. I came to Gray & Bull as I wasn't happy with the results from the previous optician that I'd used. I wanted better quality frames and more time and attention when having my eye test. Gray & Bull provided a much better service. It feels more personalised, not just getting you through as quick as possible. Gray & Bull have friendlier staff who give honest opinions when choosing glasses rather than just trying to sell the most expensive pair. I'm really happy with the service they provide. I have been a client of Gray & Bull since 1953. My current glasses are the lightest I have ever had and are so comfortable. I chose Gray & Bull as I wanted a personal service, which I received. I have had many positive comments about my new glasses. I found the staff very professional and friendly and have recommended Gray & Bull to family and friends. I was recommended to Gray & Bull by a friend when I worked in Nottingham about 30 years ago. I have always been satisfied with the attention to detail and service provided. I have been a Gray & Bull client from 1987 and the reason I return is the dependability of the service. I chose Gray & Bull as I was dissatisfied with the service from the big chains. I ended up with comfortable spectacles. I have been going to Gray & Bull since 1971. I have never wanted to change to another opticians as I have always appreciated the personal service. The staff always go the extra mile. I use Gray & Bull as my opticians as I love the frames they offer. I was overjoyed to find they stocked Dita glasses as this was on my 'to have' list! I enjoyed the whole process of buying my new Dita glasses. Everyone was really helpful and wanted to ensure that I got the right pair just for me. I found Gray & Bull on a comparison website and liked their great reviews. They were very thourough and professional and I would recommend . Very impressed. I chose Gray & Bull because I wanted a unique looking frame and top market lenses. It was more personal in every way. I am really pleased with my new frames - they look amazing. I was looking for Mykita Mylon frames and a high customer service level and attention detail. To point of collection - fantastic service level and attention to detail. I look forward to dealing with Amy and Darrell in the future. I am a previous returning customer of Gray & Bull. They have a better range, better customer experience and the shop just feels like quality. A big thanks to all the staff for making the visit a joy for me and my son. I have been a customer of Gray & Bull before. I chose to come back as they would let me use my own frame and the new lenses that I now have are really light and confortable. An excellent experience compared to other opticians. I chose Gray & Bull because they are a very well established firm with a wide range of different kinds of spectacles. I would particularly like to thank the optom who took great pains to find me the right lenses. As a result, I can now read very small print with my new reading glasses, which I have not been able to do without a magnifying glass for many years. Gray & Bull have agreeable and well-trained staff, who are a pleasure to deal with. Being from the states I had no idea how the purchase of glasses work in the U.K. Amy was wonderful making sure the new frames fit my face and that nothing was better than the 1st choice! I've worn glasses for over 10 years, this is my first experience with someone taking time to make sure my new frames fit my face and brought out my eyes. Amy and Darrell are AWESOME! Thank you! I found Gray & Bull online. They are fantastic - gave me clear and informative information. Big Thanks!!! I was recommended by D. Franks. I had a brilliant experience and I will be back next year. Darrell and Amy were both very helpful, and the optician was very good too! I wasn't happy with where I used to go and I wanted nicer glasses. Gray & Bull take more time to look at my eyes rather than rushing me through. I was recommended to Gray & Bull by my partner. I can now see with my sunglasses. Excellent experience, great customer service and fantastic product. An amazing retail experience. I found Gray & Bull on the Nikon website. Great service, friendly staff. A superb experience! I was recommended to visit Gray & Bull by my sister. They are excellent, better than any other that I've been to. Their choice of lenses is also excellent. I found Gray & Bull on the internet and liked the information on the site. Brilliant service and customer care. Thank you. I chose Gray & Bull because of the reviews on the website and I wanted a proper optician. They were excellent and did exactly what they said and on time. A very relaxed experience. An old, established firm with an extensive selection of premium glasses. Impressed with the service and advice in choosing the frames. I chose Gray & Bull as I have been having difficulty in finding the right fitting pair of glasses. I had an excellent experience, they were very friendly and helpful. Thank you. I found Gray & Bull online and had an excellent experience in store. Always friendly and helpful in every way. I chose Gray & Bull because I was impressed by the service provided to my partner a year ago. An excellent experience from entering the shop, having the eye test and leaving with a new pair of glasses. A quantum leap from my experience with other opticians. I have been a customer of Gray & Bull for many years. They offer a very personalised service. Thanks for the help and advice - much appreciated. I have been a client of Gray & Bull for many years, back in the day when Derek and David were at the helm, moving on to Sheeraz following their retirements and now most recently in February with the lovely optometrist. I chose Gray and Bull all those years ago as I wanted to go somewhere small and independent where you were seen by no more than perhaps two people instead of the sea of people in other practices. This, with the added bonus of a wide selection of unique and exclusive designer frames made it a perfect choice, and those reasons still remain the same today. The moment you walk into the shop you receive a lovely warm welcome from all members of staff and they make a real effort to converse whilst you are waiting to be seen. The optometrist put me at ease straight away with her friendly smile and during the actual test was pleasant and very professional. Now, my style consultation with the lovely, bubbly but slightly bonkers Amy. Where do I begin?? I was advised that Amy would just “know” which frames would suit me and what I would like without any input from me and I must admit I was very determined to prove her wrong! However I was very quickly eating my words (sorry Amy!). She presented not only examples of suitable frames, but more importantly, rejected examples of those which simply weren’t me. I came away with a beautiful pair of Anne et Valentin glasses and received compliments from both members of staff and other clients waiting in store alike, so quite evidently she did just “know”! The whole team are an absolute credit to Gray & Bull, everyone, Darrell, Carly and Amy went above and beyond to make sure that I was satisfied with my choice before leaving and the same applied when I went to collect them. I did have a small issue with my glasses which was nothing to do with Gray & Bull just the tolerance of my eye but it was rectified straight away after speaking to the Optical Assistant. Another lens ordered and the matter resolved, no questions, no problem. The fact that you are made to feel like an individual, that you are their main priority and they want you to be happy is almost certainly the reason I keep returning. Thank you. Gray & Bull are genuine specialists in optometry. My new glasses are very comfortable and the vision is extremely clear. The team at Gray & Bull allowed me to make a quick decision on my frames. A very enjoyable experience. 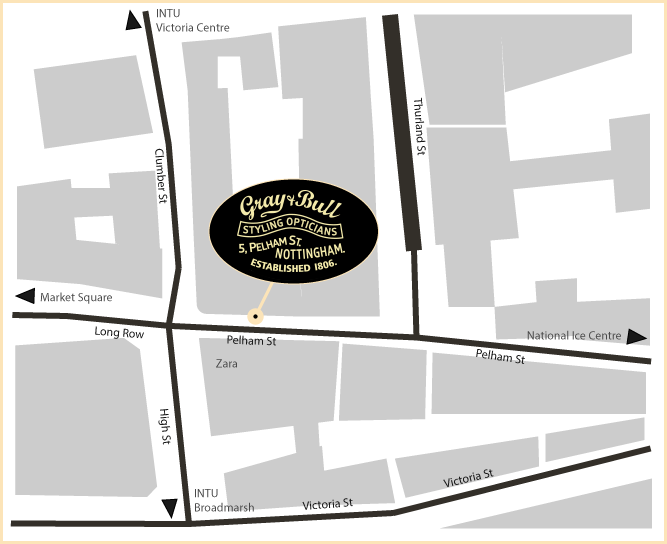 I’ve been going to Gray & Bull for close to twenty years and have always been well looked after by the amazing staff. The current team there are the best ever and my annual eye exam today with the optometrist was excellent. She’s thorough and makes you very comfortable, explaining things clearly. A great addition to the team. The selection of frames is outstanding and while I wasn’t planning on a new purchase, I found some Theo’s I couldn’t resist. Very personalised service and very helpful advice given. I found my experience to be great - quick and cheerful. I chose Gray & Bull because of the history of the shop. 1st class personal service from both the optometrist and Amy. I love my glasses. I chose Gray & Bull because of their choice of frames and styling options. A personalised, bespoke and friendly service. I chose Gray & Bull because my husband was very happy with the service. A very good experience. I always find the specs in the window look really funky. I had past experience with Gray & Bull when my son, who had congenital cataracts had his eyes tested and the optician recommended lens implants. Also, as the frames stocked are so individual, I brought my friend from London to choose her frames. From the moment I walked into the shop I was given exemplary, seamless and individual service from all the staff. My style consultation, with the wonderfully patient Amy was second to none - Amy very quickly assimilated my style and personality (barmy!) and offered not only examples of suitable frames, but equally importantly, discarded examples of those which simply weren’t ‘me’ either because of fit and shape or because they were more middle of the road safe choices. I was offered examples of what they considered suitable and they rose to the difficult challenge of fitting lenses to my final choice - Theo, Eye Witness double frames - a dispensing optician’s nightmare. The optometrist gave me a very thorough eye test, explaining everything to me and reassuring me that my recent cataract operations have been wholly successful. Her professional and friendly personality certainly made me feel as if I was in very safe hands. I was treated as an individual throughout the whole process and the team, with Darrell at the helm, clearly have a marvellous working relationship with each other, respecting each other’s individual roles but with the rare ability to place the customer (however, crazy they are!) at the very centre. I loved the individual attention; hearing about how the relationships with the various frame suppliers allow Gray & Bull to offer a bespoke service, rather than stocking the usual, ubiquitous high street frames. I found Gray & Bull on the High Street and the display and styles of frames caught my eye. Excellent service, easy to deal with and I have already recommended you to my friends. I like my glasses too. Best choice of frames at Gray & Bull, excellent experience and fantastic service. Gray & Bull stock top brands. Excellent experience and I will absolutely use Gray & Bull as my choice for opticians. Amy was very helpful. Thank you. I chose Gray & Bull because of their choice of lenses. I had a very good experience and also a lovely coffee. As far from the sterile experience on offer from High Street opticians as can be imagined. Friendly, informative staff who offer help and advice when asked. No sense of being pushed into buying what I didn't want. I was allowed to take my time, impressed by the wide range of frames, and quality on offer. Eventually I decided on a pair I really liked. Satisfied, not only with my purchase, but also with the friendly service received, I returned a few months later to buy a second pair. Can't say fairer than that! I used Gray & Bull the last two times I bought my Moscot glasses, plus eye tests now and then. Friendly, helpful and knowledgeable staff, with good facilities and a superb range of frames. Always made to feel looked after, even when dealing with someone as awkward as I can be! Kinda hope I lose my current pair so I can go back and get some new ones.. :) Warmly recommended! I have been a customer of Gray & Bull for over 8 years. I love the service they give you in a calm, lovely building. They also have great staff. A very good and experienced optician and very helpful store assistants. It was a fun experience, very personalised. See you for my next spectacle purchase. I was recommended by N. Lewis. Excellent experience - first time I've had help choosing something that suits me more. Thank you for your help. Very professional, knowledgeable and friendly. I have seen the shop a number of times and considered dropping in. Excellent service, very helpful and approachable. I was recommended by a friend as I wanted a statement frame. Amazing, friendly, knowledgeable service. I loved the experience. I was recommended by P. Rushbridge. An excellent, personal service. I chose Gray & Bull due to their very good internet reviews. They have a great range. Excellent, wonderful staff who are very helpful and well informed. Thank you. Recommended by S.Preston. Very helpful and a much more concise and considered collection of glasses than other opticians. Thank you! Gray & Bull give attention to detail and have very pleasant staff. They are more thorough and have more knowledge than other opticians. Keep up the good work and thanks for the coffee. I was referred by my son, T. Gospel, to come to Gray & Bull. They give you more time and detail than other opticians. I wanted a particular type of glasses. I looked in store and saw an excellent range, so went ahead with an eye test. Excellent experience - 10/10 in all respects. Many thanks. I have come back to Gray & Bull after having a good experience many years ago. Excellent service from the team. I chose Gray & Bull as my previous opticians cancelled my appointment. I am very happy with the whole experience. I have been coming to Gray & Bull for years. They are local, have plenty of choice and offer good clinical care with careful explanations. After being in denial I finally bought myself a pair of reading glasses! The staff were really friendly and attentive. They stock a wide range of really cool frames and it was fun trying the different styles and getting a second opinion from the lovely girls that work there. A much more personal service than the high street chains. Would definitely recommend! I chose Gray & Bull because of their choice of frames. Good customer service. Thank you. I chose Gray & Bull because of the selection of glasses and the shop front. The staff were very friendly and professional. Brilliant service. I went in thinking I suited one particular shape of glasses, but with some really helpful consultation (which was also a lot of fun) I came out with a pair that I'd never have thought I'd suit. The two ladies that helped me were really knowledgeable but also knew what glasses were 'cool' and would suit me. I'd previously been in three shops in Nottingham that day and one thing I noticed immediately was the much wider variety of querkier glasses at Gray and Bull. Thanks to the whole team! I initially wanted a certain type of frames but after talking with the (very friendly and professional) staff I settled on a pair that looked much better than what I had in mind! The range of glasses is exceptional and service is top quality. I was recommended by my G.P. I love the design of the frames. I also value the fact that the business has been running for 2 centuries. I feel I had a more accurate test at Gray & Bull than other opticians that I have been to and the staff there are very friendly and were able to answer my questions. I chose Gray & Bull because of their location and the look of the shop exterior. They are excellent. I had great help in choosing my frames and they made me feel at ease. The service given when my daughters bought their glasses was amazing and I decided to buy my next pair at Gray & Bull. The staff knew the glasses that would suit as soon as they met me - they were 100% correct. Much better service than other opticians. I felt the staff listened to me and helped me 100%. All I can say is just "Thank You". Great location and best selection of frames. Better personal service and friendly staff. Quality service from quality opticians. I have been a customer with Gray & Bull for many years. Their eye care & customer service is truly exceptional. Following some recent retinal eye surgery, the excellent teams at both Gray & Bull and John Flynn have helped me immensely. I would like to personally thank both Sheeraz & his team for all their time, help, patience and much needed expertise. All the staff are extremely caring and professional. I will definitely recommend Sheeraz and his whole team to all my friends and family, especially for anyone who has experienced any type of eye surgery. Many thanks to you & your team. I chose Gray & Bull for their range of frames. This is my first pair of glasses and I found the staff were very friendly and knowledgeable. Thanks. Great service, much more personal than the bigger companies! Great test with Sheeraz, new frames delivered to my work address in the time promised. Perfect service. "Gray & Bull stock top brands. Excellent experience and I will absolutely use Gray & Bull as my choice for opticians. Thank you." 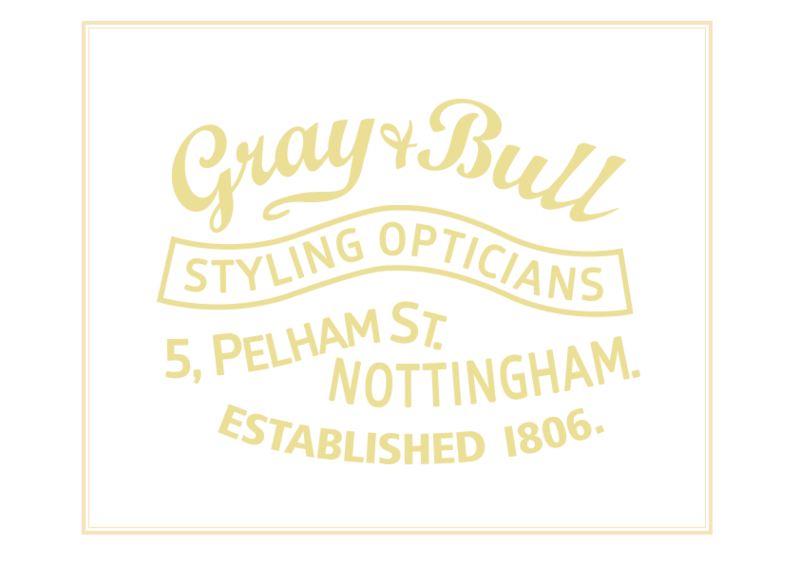 Gray & Bull is the oldest independent dispensing and ophthalmic opticians in Nottingham. It was established in 1806 and until 1939 went by the name of Gray & Selby. Based on Pelham Street - just off Clumber Street where it meets High Street and at the start of the fashionable Hockley / Lace Market area within the Creative Quarter of Nottingham City Centre. The practice is located just a few feet before and on the opposite side of The Loxley on Pelham Street, which is a few minutes walk from intu Victoria Centre, intu Broadmarsh, Kings Walk, Friar Lane and around the corner from Bridlesmith Gate, Wheeler Gate, the Flying Horse and the Exchange Arcade. On street parking is available on George Street and Heathcote Street - just off Carlton Street in Hockley. Closest car parks are the Lace Market and Trinity Square NCP car parks. Focus is always on providing a truly comprehensive and personal eyecare and eyewear service that offers patients and clients the reassurance that their vision and spectacles are being looked after by Dispensing Opticians, Optometrists (Ophthalmic Opticians) and Optometry support staff (Optical Assistants). For over two centuries, Gray & Bull has served people from all around the world providing expert service and incredible eyewear from all over the world. The team at Gray & Bull are always committed to providing advice on quality, value and service. Expert, professional guidance is provided on eyecare, glasses and contact lenses. Emphasis is always placed on a personal service, correctly fitted frames and accurately dispensed ophthalmic lenses. Gray & Bull offers both Private and NHS eye examinations (eye / sight tests) and also provides a comprehensive contact lens fitting service including after-care (checks) and supply. Gray & Bull is genuinely passionate about providing the best possible product for the needs of the client. We are known for the widest selection of frame styles hand-picked from around the world. Exclusive niche eyewear by Anne et Valentin (France), Barton Perriera (USA/Japan), Francis Klein (France), Garrett Leight California Optical (GLCO), Mykita (Germany), New York's finest Moscot - as worn by Johnny Depp, Mr Leight, SALT. (California, USA), Theo (Belgium), and Vinylize (Budapest). You will also find CAZAL Eyewear at Gray & Bull. This range was made famous by stars such as Run DMC in the 1980's. We also stock sunglasses such as Ray-Ban and Maui Jim. Gray & Bull remains committed to dispensing some of the best ophthalmic lenses by manufacturers like Essilor (Varilux), Hoya, Nikon Lenswear, Transitions Lenses and Zeiss lens into some of the finest hand-made frames and glasses (spectacles / eyeglasses) from around the world. We always welcome the registration of new patients. The practice is open from 9am-5pm Monday to Friday and Saturday from 9am-5.30pm. We are passionate about independent, original and fashion forward eyewear from around the globe. No lables. No Logos. No mass-production. "Your eyewear should not be about just a brand name or logo stamped at the temple/side of a frame, but about a personal statement, a physical enhancement, and a representation of the wearer themselves." Here at Gray & Bull, for over 200 years we have been striving to bring you the very best quality, style, asthetics and service. Our role is to help you look past the familiar lables, both in terms of eyewear brands and your perception of yourself. Rather than only giving you what you want, we offer unique options you never knew were available and give you something more, something you never knew you wanted. Give yourself permission to be surprised and see yourself in a whole new light. Our staff of Dispensing Optician, Optometrists and Optical Assistants have years of experience in finding frames that fit each individual's facial features and personality as well as determining the very best ophthalmic lenses for the widest range of prescriptions. Our expert staff love to share the stories of each of our chosen independent brands. We remain the authority in independent lines in Nottingham. To learn more, visit, call or email us. Do you want to keep up to date with our news, brands and special offers? Subscribe to our emails by completing the form below.